After a two hour trek across Lake Louise and back to the Chateau and by the time we reached Banff, we were riddled with cravings for salmon (or really, anything other than sandwiches and soups), so we headed straight to The Maple Leaf, number one on my list of Banff eateries. Also, after not finding a single fireplace (working) at the Chateau, we were tempted to ask if there was a fireplace at the Maple Leaf, to which we got the response, "one moment please", and then, voila! A table RIGHT beside the fireplace! 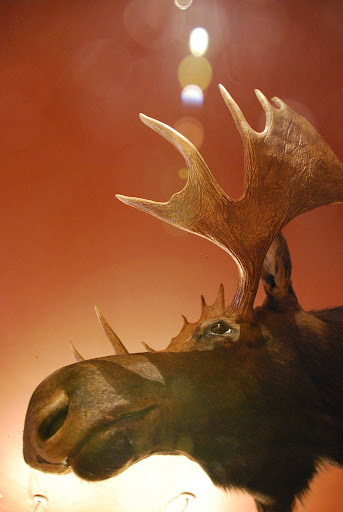 Mind you, not only a fireplace, but a giant moose head to go with it, right above us. I love Banff. Everything's so rugged, so earthy, so natural. If it isn't wood, it's leather or stone. The Maple Leaf ambiance was beyond cosy. The Atlantic Wasabi Salmon...sesame-scented Asian noodles, nori, pickled ginger. The other item we ordered was the Mahi Mahi sandwich (I know I said enough with the sandwiches, but it sounded so good!) with potato and leek soup (okay, I take it back). Our only - and very slight - qualm was that the "Coke" tasted more like Cola and then we figured out it was DIET Coke. Er, no thanks. Not on vacation (or any other time, for that matter). Our server was very accomodating and made no fuss. Our adjoining table of seven or eight however, complained about their regular burgers being too pink and found out that the regular burgers also had a mix of bison in them (the server said something about bison burgers being more on the pink side). They voiced that the menu made no mention of the bison mix in the regular burg and they'd have loved to have known beforehand...etc.etc. If I hadn't overdone the whole burger thing having had two in the last four days, I would have ordered the regular burg as well, but the salmon and mahi mahi sandwich was exactly what we needed. The salmon dish was amazingly good. Surprisingly, the noodles were chilled, but together with the crispy (breadcrumbed and fried) salmon and the fresh ginger slices, the dish was refreshing and satisfying. The fish sandwich was tasty as well; we tried to pinpoint the "indian" flavour in it. At first I accredited it to the chilly yogurt mentioned in the menu, but then it dawned on me as being CILANTRO (to the joy of N and to my dismay). If you know me, you know I am not a fan of the green stuff and its overpoweringly horrid scent. That said, it was still a good sandwich. Washed down with a cold glass of real Coke, that is. The potato and leek soup was the perfect antidote to an active Winters day, while the Maple Leaf was the perfect end to an active Winters vacation.